When it comes to choosing a lab coat, you’ll want something that flatters your body type and speaks to your personal style. 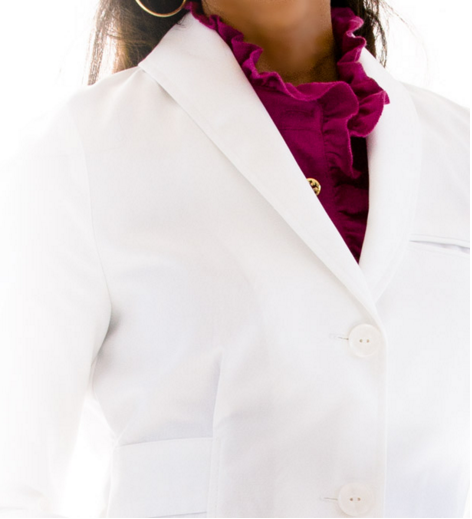 Medelita lab coats come in a number of styles, each with its own unique design details that individualize each style. Lab coat lapels, for example, say a great deal about the wearer’s fashion choices. Notched lapels, as found on the M3 Estie Lab Coat, are traditional yet contemporary and are often seen on professional blazers and suit jackets. If you’re unsure about what style lapels you prefer, notched lapels are always a safe choice because they are versatile and universally appropriate in just about any setting. You can find an example of rounded lapels on the M3 Callia Lab Coat, which is a more feminine lab coat. Rounded lapels almost appear to resemble the petals on a flower, giving a softer, feminine look that is also sophisticated and elegant. As seen on the Emma W. Lab Coat, shawl collars create a continuous curve of fabric that rounds the neck. This style was originally seen on the Victorian smoking jacket, and it is now a very popular style for dinner jackets. Shawl collars create a very elegant, graceful silhouette. The envelope collar is a popular style that made its debut on the Vera G. Lab Coat. This collar style is graceful and tasteful, and is marked by lapels that are turned down flat at the seam. This low maintenance lapel style is sleek and modern, giving the wearer a streamlined silhouette. This entry was posted in Collared Lab Coats, Lab Coats, Women's Lab Coats and tagged Lab Coat Lapels, lab coats, Lab Coats For Women on March 1, 2016 by Ariel Jacoby. I kept yelling at the end ‘ITS NOT DONE… don’t give up… noooo” 1) totally adorable kid.. did he say it looked like poop early on? 2) no screaming no barfy no2&ess#8i30; good cam. Awesome puss elbow thingie. Thanks for posting!